According to many who attended, the line-up shown in this Helix wrap-around came closest to the actual bill, although ultimately there were plenty of additions and no-shows. 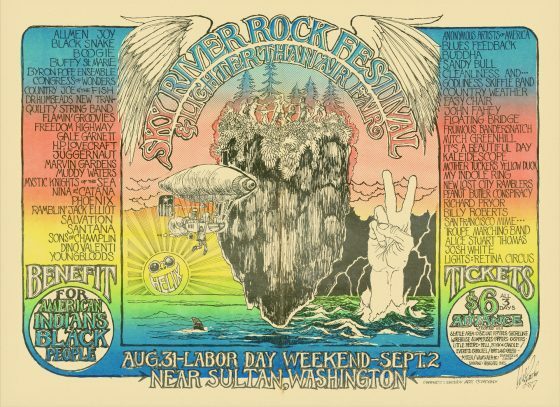 There’s still some inconsistent memories of the performers that actually took part, but we know the Grateful Dead took part (The Grateful Dead’s full set was filmed) and we’ve been told this poster is the closest thing to the final line-up. Other acts are certain to have played. Country Joe and the Fish (who had taken part in an earlier event that inspired the festival-more on that later) an unexpected, unscheduled Jam between Big Mama Thornton, James Cotton (who’d supposedly flown up with The Dead) and Billy Roberts-the writer of “Hey Joe”. The proceeds of the Festival were to be donated to Native American organizations, as well as to the black community. Unfortunately the Festival failed to make a profit and came up short $5000. A modest amount, to be sure…but it certainly would have made a profit if all the attendees had paid admission instead of sneaking in. The weekend was almost completely rain-drenched even though the showers were intermittent. It’s said that an underground spring began to flow because of the activity. Before the final act played the crowd is reported to have chanted “no rain-no rain-no rain” According to the reports of many festival goers the sun finally came out as the festival ended, appropriately with a performance by “It’s a Beautiful Day” It’s believed that this version of the Sky River festival (there were three in all) was the first organized rock festival held in an open air venue in a rural area. The much more famous Woodstock Festival would not happen until almost a year later; August 15–18, 1969. Click here to see it in all its psychedelic glory. More Helix related posts to come. I was at this festival. It was a muddy mess. Do you have any of these posters as prints for sale? The mud people poster (for the 2nd Sky river rock festival in tenino) had a good friend of mine center and front. He’s the hippiest hippy at the hippy rock festival….in the pic he has the long ponytail and the girl sitting in the mud trying to hold his hand. Rod Freeman from Port Townsend. I also can find myself and the friend I went there with (Icabod Cane from the radio later) in some of the other pics on line. I heard there was going to be a 50th anniversery party of some kind but I googled it and it looked lame. I got there for days 2 & 3, along with my girl friend and my dog, Spot. Yes, it rained a lot, a muddy mess. The trick was to stay awake for 40 hours. I still have a copy of the Crowley poster! It’s in storage.